Perched high up at 180 metres above sea level, the highest point in the Salento region, I Mulicchi is located just 10 minutes from the Ionian Sea and the Adriatic Sea. A perfect starting point for exploring the treasures of the Salento region – from its sheer cliffs to its long expanses of beach – I Mulicchi can be found 106 km from Brindisi airport, 14 km from Pescoluse beach and just 1.5 km from the village of Specchia – renowned as being one of Italy’s most stunning villages. 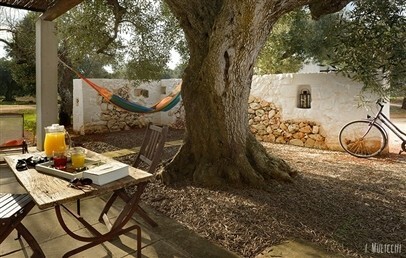 Surrounded by an expanse of ancient olive trees, I Mulicchi offers guests the opportunity to enjoy the silence and tranquillity of Salento’s nature, far removed from urban noise, fully immersed in beautiful countryside. 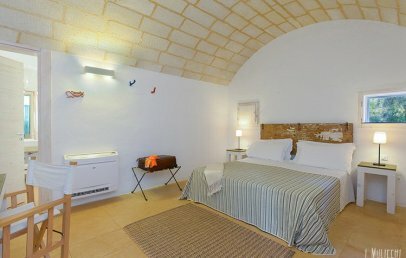 Guests stay in pajare, stone buildings with thick walls and barrel-vaulted ceilings, typical of rural areas in the Salento region and which keep the indoor temperature mild in the winter and cool in the summer. Each pajara has two separate guest rooms, each with its own private entrance on opposite sides of the building, and both with a private patio where guests can relax in the shade of reeds. 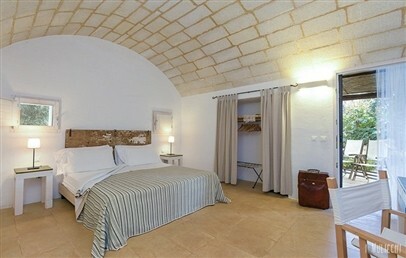 Light colours, Leccese stone flooring and local handcrafted linen are defining feature of all rooms. 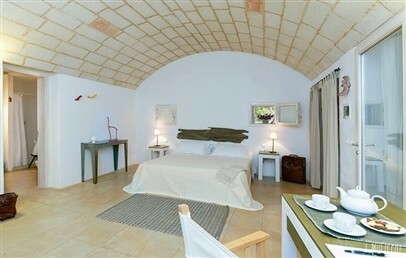 The rooms are simple and functional furnishings, discreet and relaxing ambiance. Positioned between the Ionian Sea and the Adriatic Sea, I Mulicchi boasts a huge range of beach options for beach aficionados. The Ionian coast (14 km away) is known for its long sandy beaches, while the northern part of the Adriatic coast (12 km away) offers sandy stretches with towering cliffs that fall away to jagged rocky inlets overhanging the sea and exploding with caves and small coves as you head further south. The hotel doesn’t have its own restaurant serving lunch and dinner. A home-made breakfast of local products is served in the hotel offering both sweet and savoury options. I Mulicchi has a stunning pool surrounded by the greenery of almond and fig trees, offering guests a wonderful place to lie back and relax. Free Wi-Fi connection is available throughout the resort. There is also an area set aside for guests to taste typical Salentine delicacies. Free on-site outdoor parking is available. 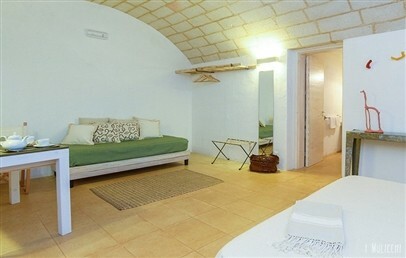 Rooms with simple furnishings, light colours and Leccese stone flooring. Local handcrafted linen, comfortable and relaxing ambiance. En-suite bathroom with shower, private patio with table and two chairs. 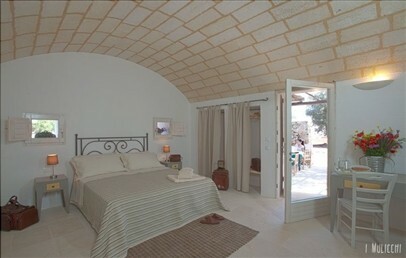 Rooms with simple furnishings, light colours and Leccese stone flooring. Local handcrafted linen, comfortable and relaxing ambiance. 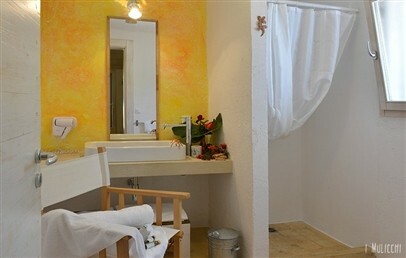 En-suite bathroom with bathtub or shower, private patio with table, chairs and sun lounger. 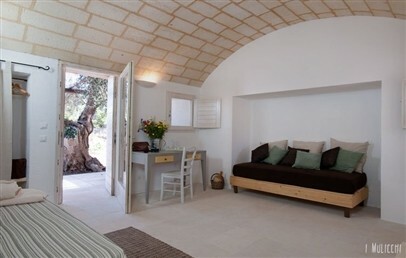 Rooms with simple furnishings, light colours and Leccese stone flooring. Local handcrafted linen, comfortable and relaxing ambiance. 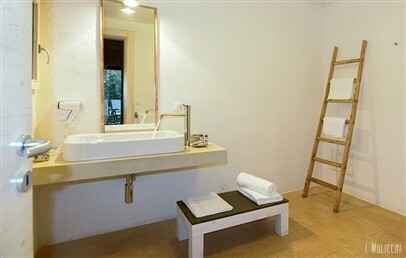 En-suite bathroom with bathtub or shower, private patio with table, chairs, sun lounger and outdoor sofa.